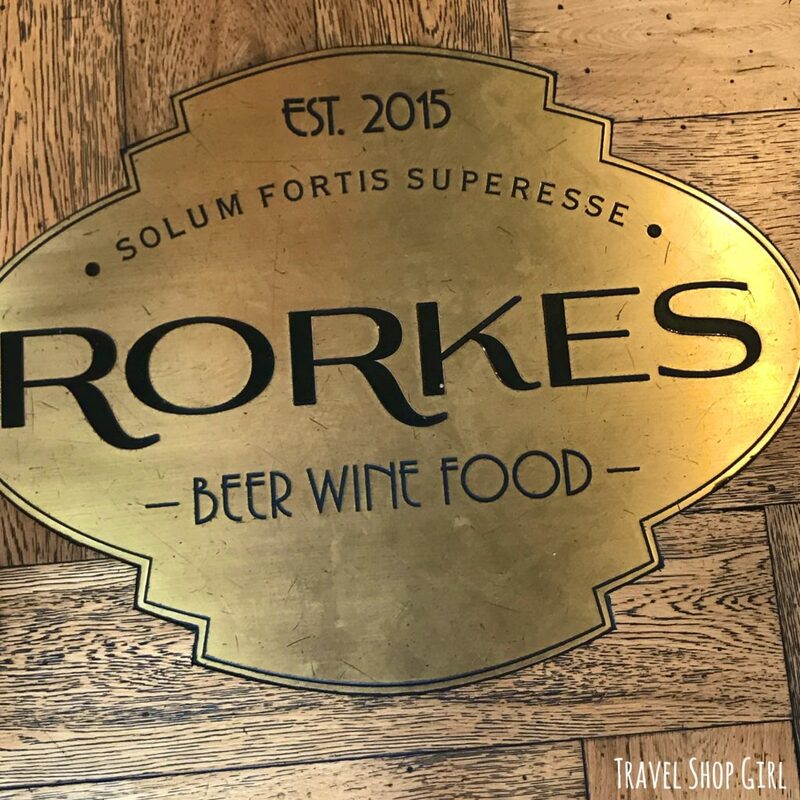 Our latest port of call on our world cruise on board Fred. Olsen Cruise Lines Black Watch is Darwin, Australia. 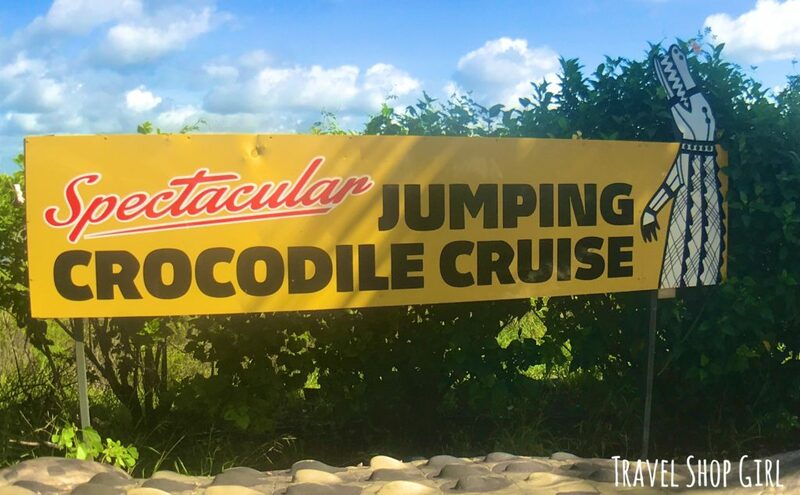 That means today we will be chasing crocodiles and braving the heat. In case you didn’t know, Darwin has a population of 145,916 people and is the capital city of the Northern Territory of Australia. As Black Watch was docked in the port of Darwin, we only needed to walk off the ship and through the port to board our coach. 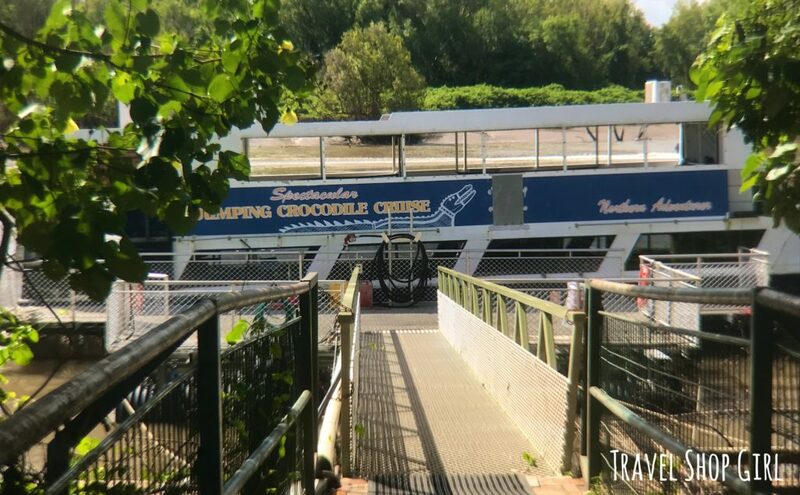 We were taking the ship sponsored excursion, Jumping Crocodiles, and needed to find coach #4. 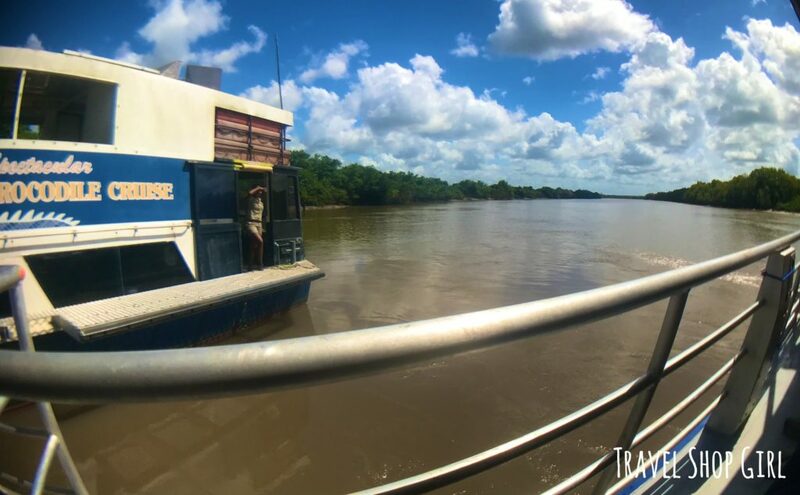 We boarded and after 60 minutes and views of nature, water buffalo, and narration by our tour guide Dave, we arrived ready and anxiously waiting for some crocodile action. 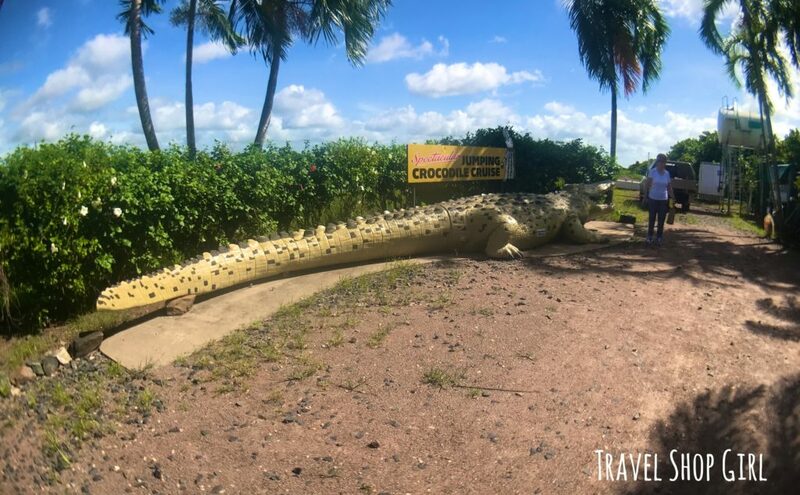 We arrived at the Spectacular Jumping Crocodile site where this massive crocodile statue sits. That means, of course, everyone had to pose with the large crocodile out front. 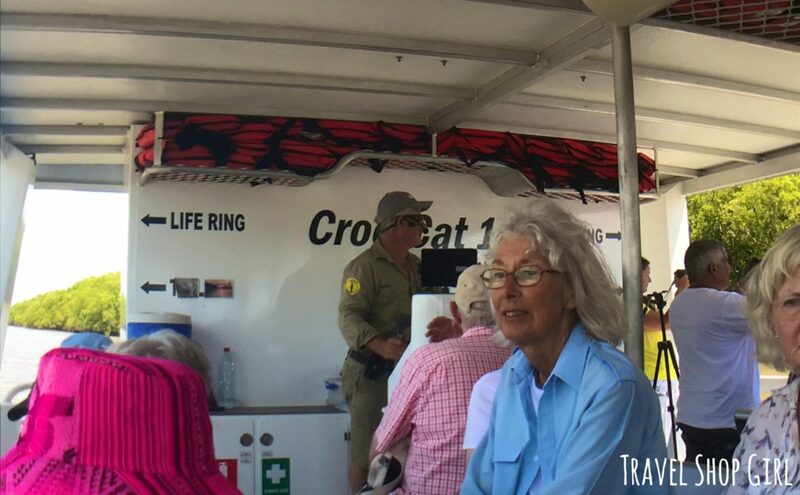 We had to wait about 45 minutes to board our boat by walking onto the jetty and through another boat. Seats near the front of the boat offer closer views of the action, which is where we chose to sit. 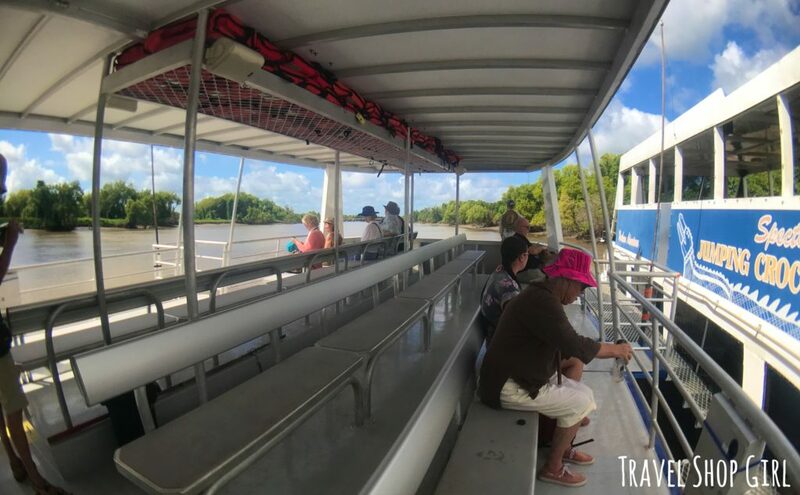 Seats at the back of the boat allow you to stand and offer different views. We chose seats closest to the action and that inadvertently meant near the food buckets. Yes, that’s a vegan’s worst nightmare, especially when you get some meat splashy goodness all over your feet. The captain set the boat in motion and we soon were in the middle of the Adelaide River. Not three weeks earlier they had the worst flooding here that’s ever occurred. 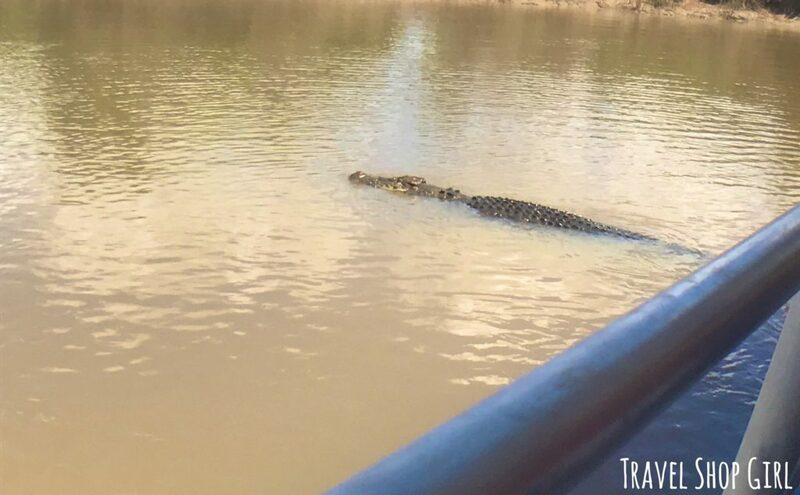 It wasn’t long before we got to see our first Crocodile. 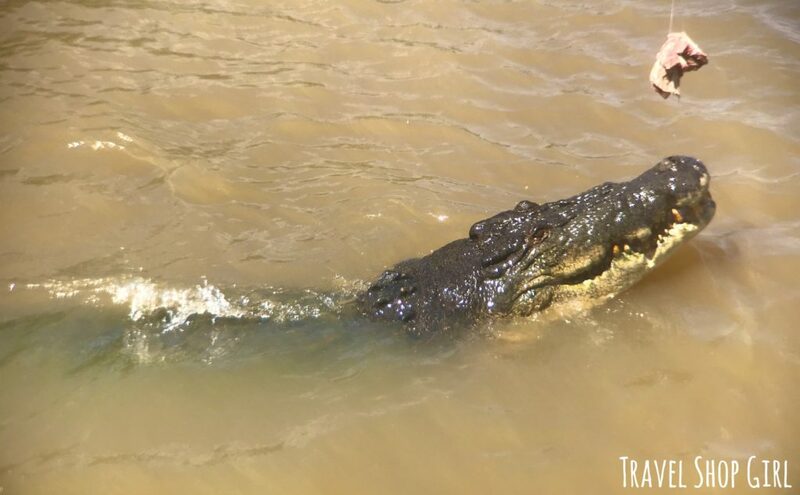 Did you know that most of the Crocodiles you see are female? Females are around 3 meters while males are around 6-7 meters in length. 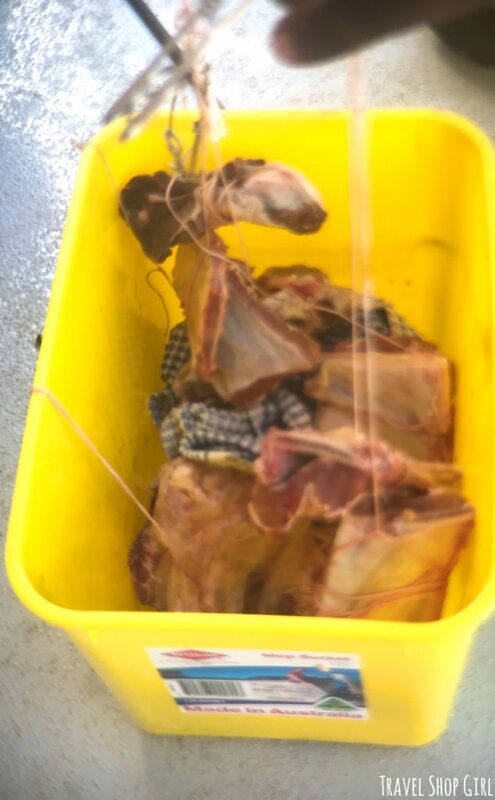 The crew member pulled meat from the yellow bucket next to me to put on the feeding pole. 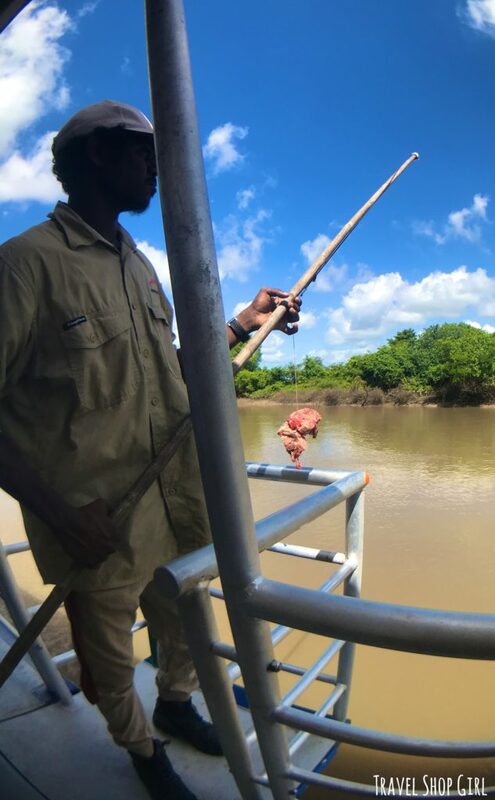 Turns out this is buffalo meat that’s mostly bone as the cartilage is a good, healthy snack for the crocodiles. They don’t need to eat often and can go up to 12 months without eating. 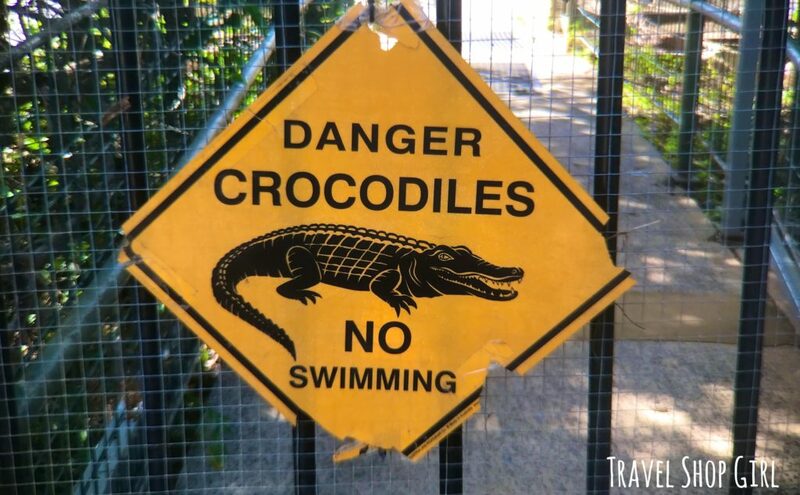 I stress out if I miss breakfast so no thank you Mr. Crocodile. 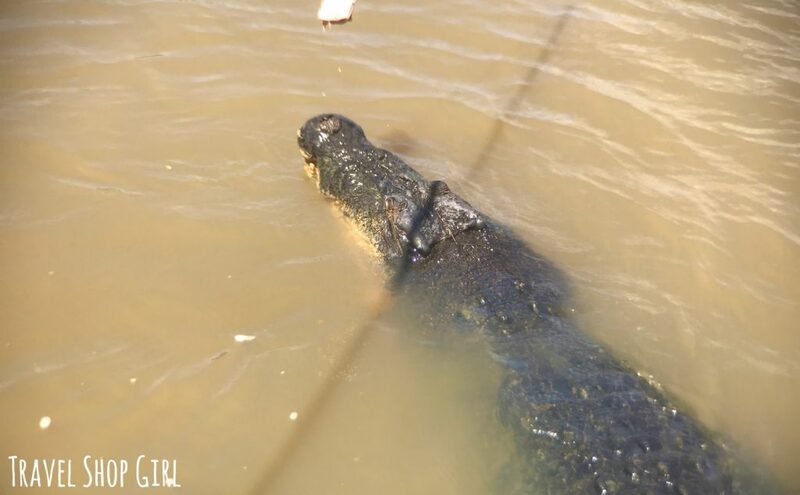 Soon we saw a crocodile approach once the meat on the feeding pole was splashed a few times in the water. They have to earn their food so they’re not fed immediately. Once they are given the food, they come up out of the water and it’s gravity that forces the food down. 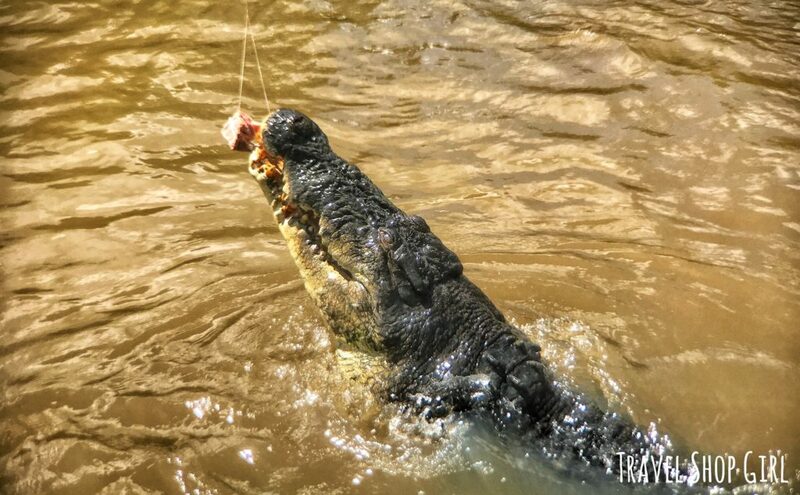 TSG Tip: Did you know that crocodiles usually have rocks in their stomachs to help balance them? 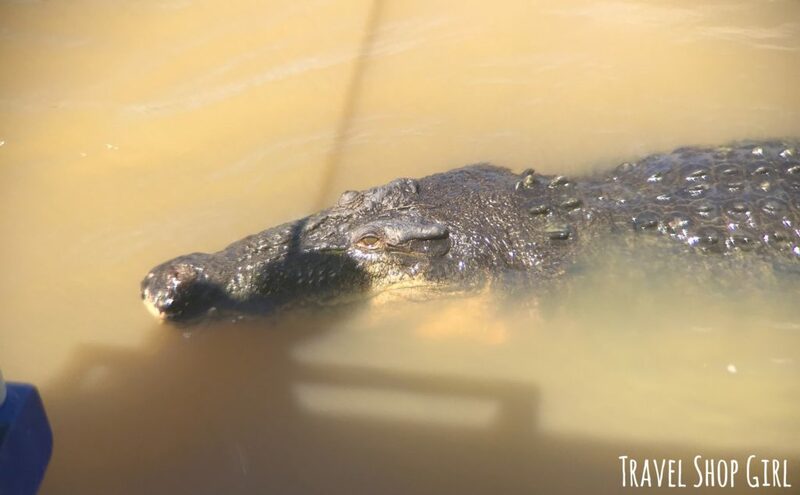 Another crocodile we got to visit was Stumpy. When they first saw him 20 years ago, he was missing a leg. Then he met a girl named Candy. Stumpy is about 70 years old and Candy is 20. Go Stumpy! But apparently Candy had another suitor, Trevor. He didn’t like Stumpy and took off two more of his legs. So now Stumpy is down to only one leg. But guess what? Stumpy ended up with the girl in the end. While some may want to kill off crocodiles for food or other reasons, they play a valuable role within a fragile ecosystem. Since they don’t eat much, when they do kill, they take a small portion and leave the remainder for the other animals in the environment. Remove them and the entire ecosystem can fail. While they might seem terrifying, they serve a vital purpose within an ecosystem that can’t survive without them. The captain of our boat was an amazing commentator who entertained and educated the entire group on our tour. He advised what to do and not to do during our cruise down the Adelaide River. For example, he said that red wasn’t a good color to wear in front of the crocodiles, “like the woman with the red hair.” Yeah – never saw that one coming, right? In addition to eagles, there were also birds called “kites” flying alongside the boat. The crew fed them as well and they swooped down and did aerial acrobatics for their meal. Soon our hour long boat ride was over and we had to pile back onto the coach to return to Darwin. Passengers could go to Darwin and catch the shuttle, walk back, or get dropped off at the ship. Danielle was feeling hot and wanted to go back to the ship but somehow I convinced her to walk around Darwin for just a little with me. The center of Darwin is small with a pedestrian only shopping area with shops and restaurants. 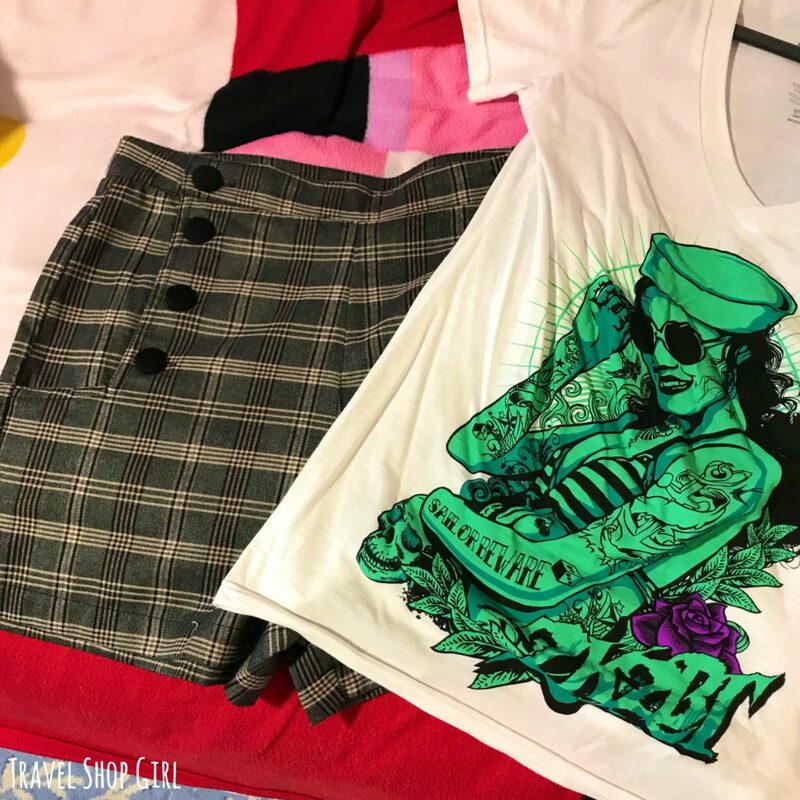 There was a store with aboriginal art, some clothing boutiques, and one really cool store called “Off Ya Tree” where I got a T-shirt and a pair of high waisted retro shorts with buttons. Danielle found a few things and some souvenirs to take home for friends and family. But after shopping, we were definitely hungry. Then we walked over to Rorkes pub that we had seen when we got off the coach. There was air conditioning so regardless of what they served, we were loving this place already. 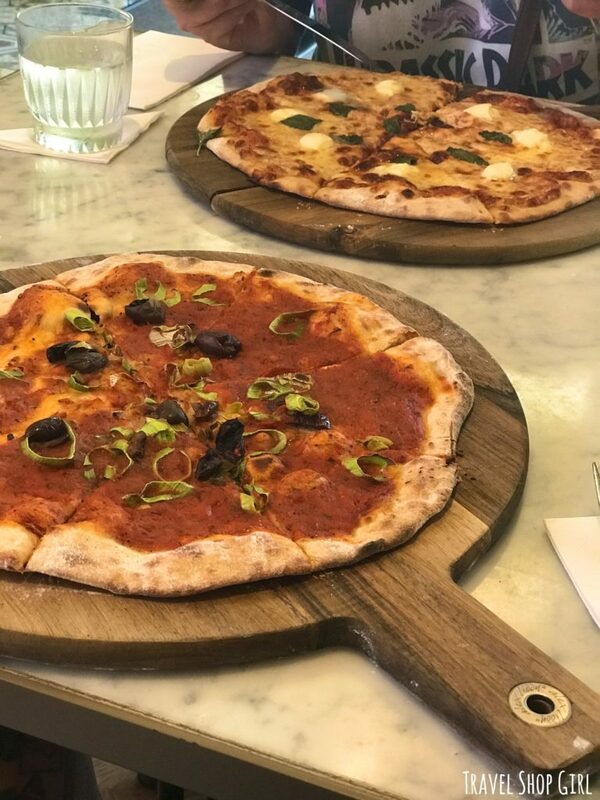 We checked out the menu and both decided on pizza. Danielle wanted the margherita pizza without basil, which is one of her go to safe but usually good menu items. As for me, I opted for the Virgin pizza with tomato, kalamata olives, garlic, olive oil and oregano. And of course, no cheese. The bartender asked if we wanted drinks and I ordered us water, but couldn’t resist reading over the drinks menu. I saw a margarita on the menu and we all know how much I love tequila so I just had to have one. Ok, two, but who’s counting. 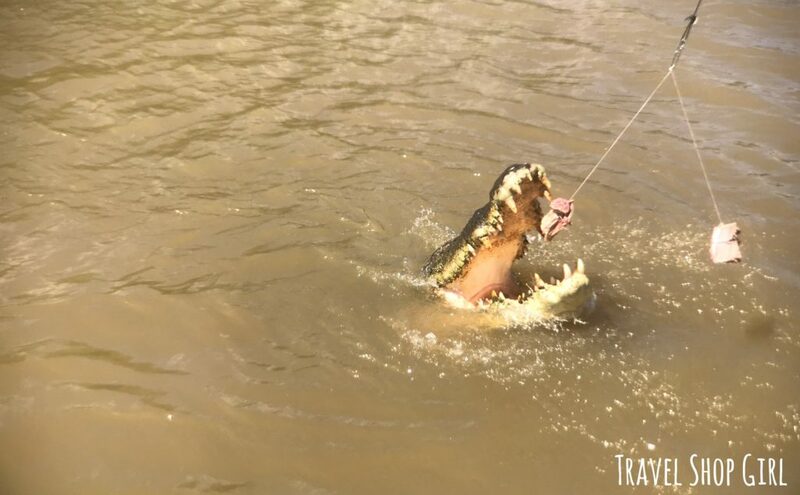 Our trip to Darwin was an exciting little adventure, especially as I’d never seen crocodiles up close and personal before. 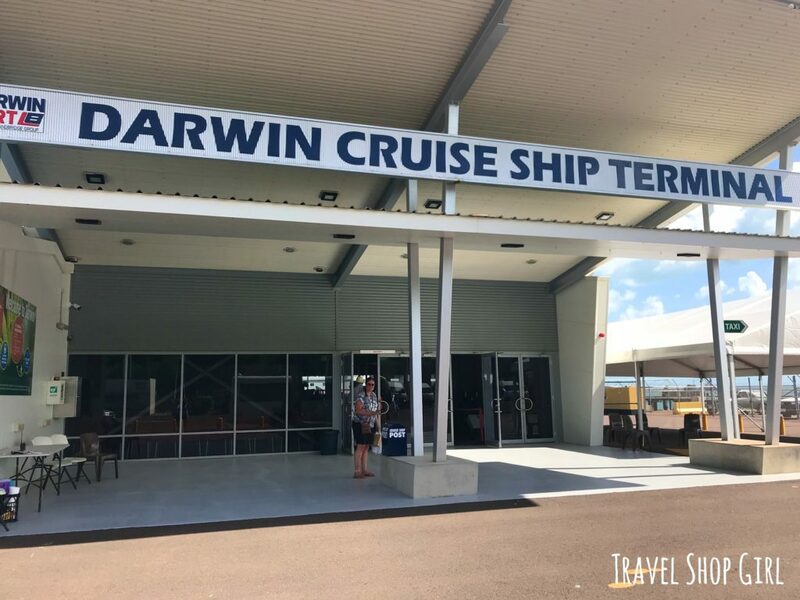 Throw in a great lunch and shopping and Darwin was definitely a fun, casual, laid back kind of port to visit. 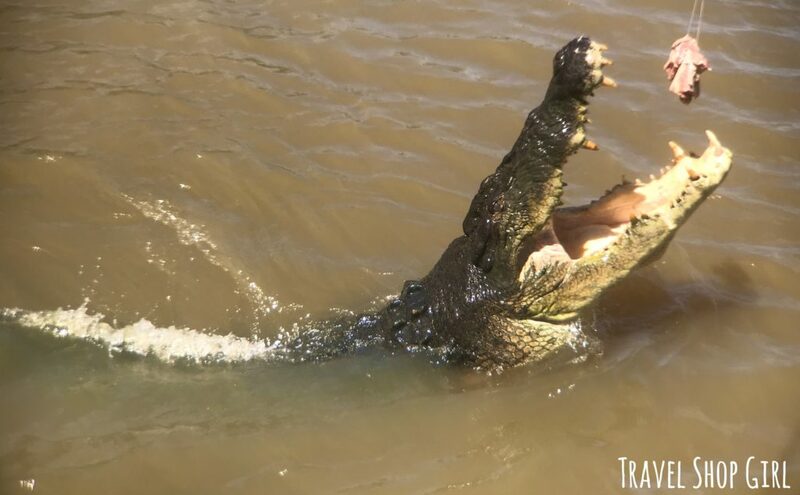 If you see Darwin on a cruise itinerary, definitely consider spending the day with some crocodiles and exploring Darwin. Have you visited Darwin? Can you suggest other destinations in Australia that you found equally exciting? Leave your comments below. 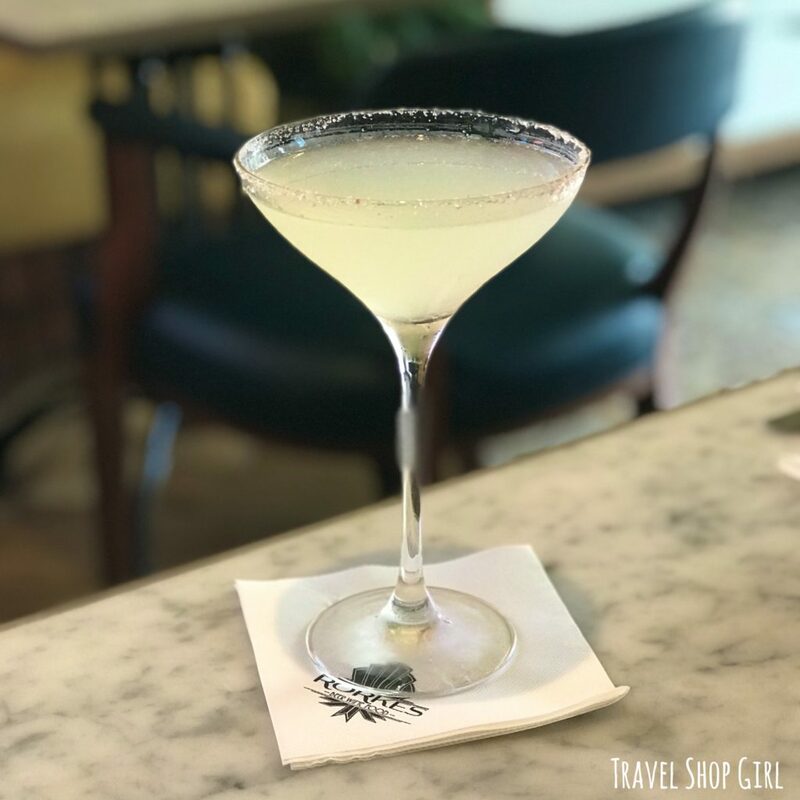 Discover some other great destinations and travel ideas here on the Travel Shop Girl website. 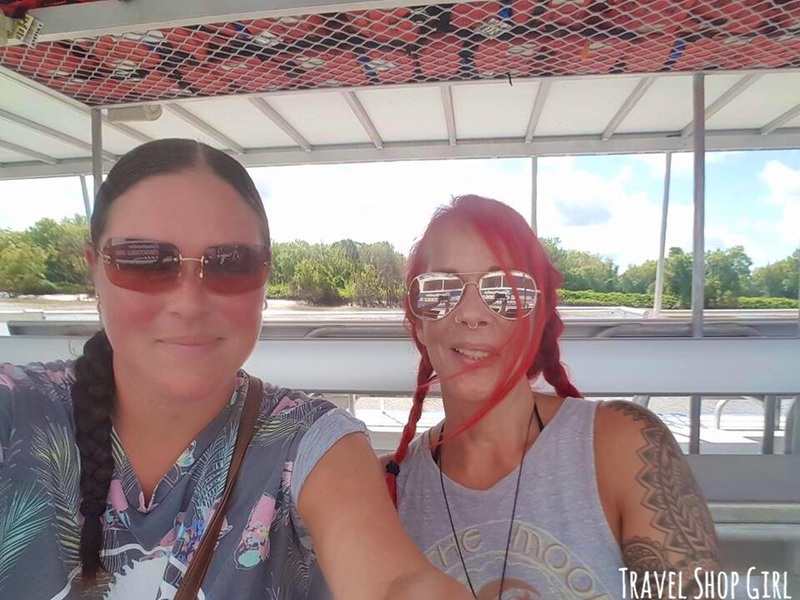 On my new SPONTANEOUS TRAVEL SCALE of 1-5, with 1 being super easy and spontaneous and 5 being you better plan far in advance, Darwin scores a 5 for spontaneous travel since it’s easy to get to and you can definitely enjoy a day full of shopping or more in Darwin on your own.